To change settings of a module that hosts the file you are currently editing, just press Alt+F1, 7 or open the View menu, select Select In and click Project Structure. 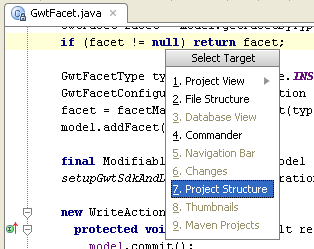 IntelliJ IDEA will open the Project Structure dialog and jump to the required module. This action works for files from libraries and JDK, too, and is available in every view that lists files — Project View, Changes tool window and so on. This entry was posted in Tips & Tricks and tagged Code Navigation, Productivity, Usability. Bookmark the permalink.